First make an account on Tumblr. Now it is time to find an audience for your blog. Now there are two options to find a niche audience for your blog. Either you create great content and then hope people will start following you. Yes it works but only in 10% cases. And these methods are also very slow to find a niche audience. If you really want readers for your blog then here is a simple formula that always works and that is "follow and get followed". Right if you follow others then you will also get followed. And it has been seen in 70% cases that if someone follows another person than that person also followed by that person. Hence this way chances are very high that people will follow you. So below is step by step process through which you can get targeted audience that will help you to increase traffic to your blog. Go to Tumblr, Create a blog and now it is time to search targeted audience. You can see a search box. Now it is time to find people who are related to your niche. So type any keyowrds that relates to your blog. 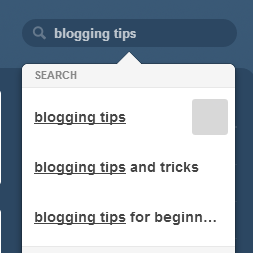 Like I type blogging tips. You can see other tags also that Tumblr suggests. You can see these are the tags that are most popular. Now hit the search button and Tumblr will display all the related people in your niche. You can see follow button in the image. You have to click on that button and follow the people and in response they will follow you. NOTE : - I followed 250 people and in response 51 people following me. So chances are 20%. This way you can build your audience and if you follow 2000 people then you will have at least 400 followers. So it is a prediction but if you consistently add links and submit niche posts then you will surely have more followers. So this is the way through which I got a 3 % increase in my traffic by just submitting links. And my followers are mostly related to my niche so I got pretty good response from them. Now it is time for link submission and how I got traffic from Tumblr tags. I assume that you have created a blog and ready to submit your links and I also assume that you have your followers. Now hit the link button first. Now when you will hit the link button another window appears and prompts you for link submission. 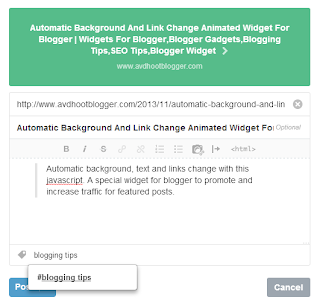 Now as you see when you paste your url it automatically detects your post title and its description. The only thing that you have to do is tags. The only thing that will bring you traffic is tags. So, type your tags with great care. Well there is no limitation on using tags. You can choose as many tags. Tags means type your keywords related to your niche. In order to find more tags you can take help of many websites likes and tools like. These three are best to find keywords. Now if you have found the best keywords than type them and hit post button and you are done. So this was the way I was using Tumblr which increased my traffic by 3%. I showed you how to submit links and how to choose tags. So do it and enjoy. If you find this article informative then please share it and do comment. Description : Yes here I will show you how I got 3% traffic growth from Tumblr tags. Tumblr is a great way to drive referral traffic and to find targeted audience.